You will be relieved to know, (or probably not, really, chances are good that you are not particularly affected, more accurately, I am relieved to know), that my husband does not, in fact, suffer from Ulcerative colitis. Not at all. He is bowel-syndrome free on all counts. Whew! My platy is not pregnant. My platy may not even be female. My platy is, I believe, just a little bit fat. Yes, it is true. THE ULTIMATE SUMMER ROAD TRIP, henceforth to be referred to as TUSRT (rhymes with dessert! ), will no longer make a counter clock-wise circuit through Wyoming, Montana, Idaho, Washington, Oregon, California, Arizona, New Mexico, Colorado, Wyoming. Instead, TUSRT will follow a route that is the exact opposite! Mind-boggling, isn’t it? Departing Wyoming south through Colorado and into New Mexico. Joining Historic Route 66 at Santa Fe and following The Mother Road west through New Mexico, Arizona, and California to its terminus at the edge of the Pacific ocean. Joining the old Pacific Highway north up the coast of California, Oregon, and just into southernmost Washington. Heading east through Oregon, Washington, Idaho, and Montana. Current planning has us involved in a mad dash from Wyoming and through Colorado the first day (sorry, Colorado! ), in order to park our butts in Santa Fe, NM that night. When we awake on that glorious first morning, it will be as road-traveling warriors with The Mother Road stretching ahead of us into the Land of Enchantment. 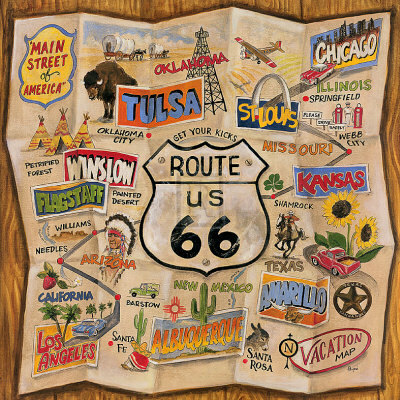 That’s right, mis amigos, we will begin TUSRT on New Mexico’s fabulous stretch of Historic Route 66. Why have we chosen to alter the original plan and begin our circular route heading south instead of heading west? Well, quite frankly, the original idea was not well thought out. The thing of it is, we are very excited to see New Mexico, having never been there, and also to experience the fabulous desert landscapes of Arizona and California. There is a definite feeling though, that those things will be appreciated more fully if experienced while on route to the Pacific ocean, rather than with the gentle breezes and caress of ocean waters at our back. Really, there is a definite possibility that desert landscape might seem to be less fascinating and more along the lines of simply really hot and really dry after cavorting in the waves off the Santa Monica pier. Which means that the Hantavirus will be of immediate concern as we begin our journey into the deserts of New Mexico. (Firm note to self… Do NOT pick up the desert rats!) Also, that long before we visit the Oasis Bordello of Wallace, ID, the fabulous historic district of Butte or the healing radioactive mines of Montana, we may, or may not, be facing the dreaded La Bajada Hill. 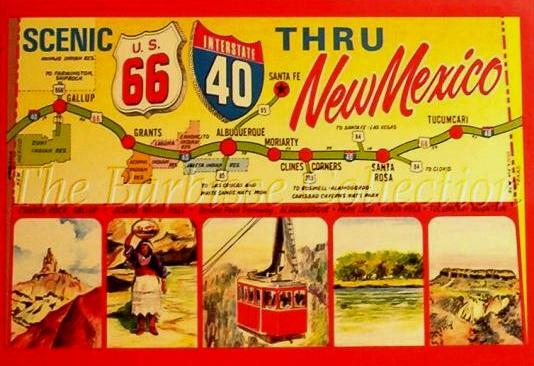 The original alignment of U.S. Highway 66 in New Mexico was laid out in 1926 and ran west from Tucumcari to Santa Rosa; from there it followed the Old Pecos trail north through Dilia, Romeroville, and Pecos to the capital of Santa Fe. It then looped back to the south over La Bajada Hill, (arguably one of the most difficult sections of the entire Route 66 highway) and headed down into Albuquerque. “La Bajada” is Spanish for “The Descent” or “The Drop,” and descent or drop it certainly is, for it is a drop of about 800 feet from the rim of the mesa to the foot of the hill, which makes a drop of about 1,000 feet to the lowland. The road, one and a half miles long, is one of the marvels of road building in America, for it is cut out of volcanic lava in the face of an almost sheer precipice. It has 23 hair-pin turns, some of them having a very steep grade. In spite of all this, the road is perfectly safe, as all the turns are widened to accommodate the largest automobiles, and those that might prove dangerous have stone retaining walls on the outside to prevent cars going off the road and down the cliff. The trip up or down La Bajada is always remembered by those going to or from the Pacific Coast over the Ocean-to-Ocean Highway. “The road is perfectly safe” seems somewhat optimistic considering the sign posted by the State Highway Department at the top of La Bajada. “Safe for a Sane Driver” is not exactly the same as “Perfectly Safe“, is it? The hellish switchbacks, the sudden 500 foot drop, and the fact that many vehicles were forced to use reverse gear and to literally drive backwards up the steeper areas (due to the gravity-fed gas tanks of the time, reverse was the most powerful gear), caused many travelers to actually hire locals to drive their vehicles over the mesa. 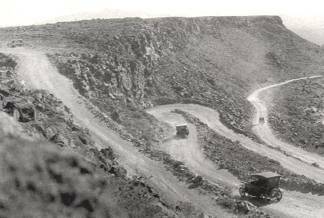 Becoming an un-maintained road has not improved conditions over La Bajada; current warnings include such bon mots as “extremely challenging to drive”, “high clearance 4×4 only”, “experienced high altitude drivers only”, “Don’t even think of it in wet weather”. By 1937, the new Route 66 alignment bypassed Santa Fe and La Bajada Hill altogether; a straight line of pavement heading directly east from Santa Rosa to Albuquerque. Considering that this new route saved travelers 90 miles and the hellish drive over La Bajada, it was a sound plan from a road-engineering standpoint. This was not, however, why it was done. New Mexico’s governor, Arthur T. Hannett, realized that he was not going to be re-elected and blamed Santa Fe politicians. In the limited time he had left before a new governor took office, Hannett conceived a diabolical plan that by all rights he should never have had time to complete. Obviously a determined fellow though, Hannett managed, in two months time, to have an entire new stretch of highway built between Santa Rosa and Albuquerque, which left Santa Fe high and dry and entirely off of the highway route. Take that, Santa Fe politicians! You just have to admire that kind of bold cheek, don’t you? We, the road-traveling warriors, will face a pivotal moment of decision in Santa Fe as TUSRT begins. 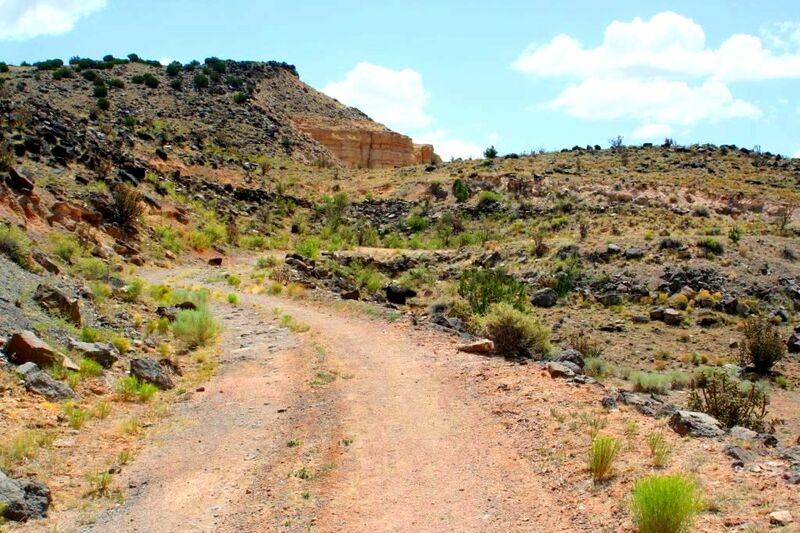 To follow the post 1937 loop down to Santa Rosa and then backtrack east to Albuquerque, bypassing the horror of La Bajada Hill altogether OR to follow the pre 1937 route southwest over the 1000 ft. mesa. You would think this would be a no-brainer decision (right? ), but you would be thinking that because you haven’t met my husband. 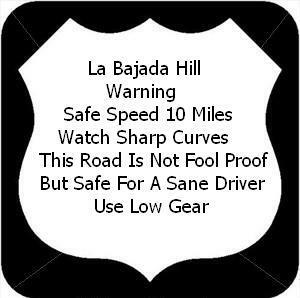 Who thinks La Bajada Hill sounds like a really good time. …which, incidentally, will require us to take the post 1937 route (a.k.a. the non-La Bajada Hill crossing route). 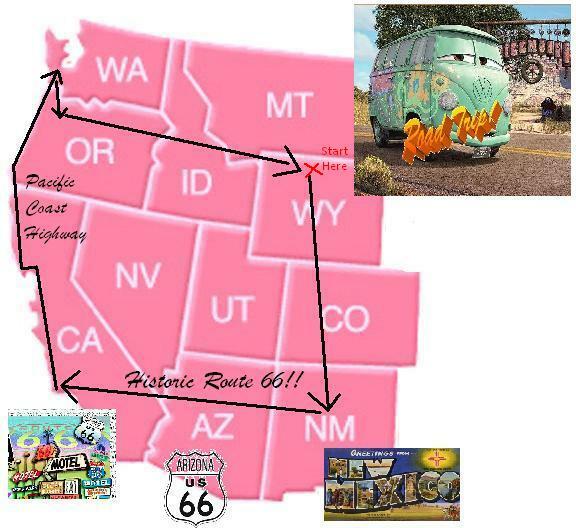 The clincher for me, though, is this; I recently discovered that the Tinkertown Museum in Sandia Park is located along the post 1937 alignment of Route 66, and I really, really want to see the iconic Route 66 attraction that is Tinkertown. What can I say, the 40 years that Ross Ward ( ~motto “I did all this while you were watching T.V.”) has spent creating Tinkertown just seems so much more attractive to me than the Über~amount of eons that Mother Nature spent on La Bajada. Interestingly enough, Arthur Hannett did write a book and quite a good one. It was entitled “Sagebrush Lawyer” (New York: Pageant Press, 1964), and it mentioned his realignment effort of Route 66 in great detail.